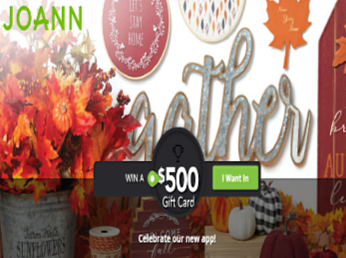 Joann “New App” Quikly Sweepstakes – Win a $500 Joann gift card! Win a $500 Joann gift card! ENTER SWEEPSTAKES HERE – Joann Quikly Sweepstakes page. ENTRY LIMIT – Limit one entry per person. Earn extra heads-up time by sharing sweepstakes with friends (you earn the time when they enter). ELIGIBILITY – The Promotion is open only to legal residents of the fifty (50) United States and the District of Columbia who are at least eighteen (18) years old at the time of entry and have a mobile device with a valid phone number to confirm opt-in. SWEEPSTAKES ENTRY PERIOD – The opt-in period begins on September 4, 2018 at 5:00 a.m. Eastern Time (“ET”) and ends as soon as the live release in the Quikly campaign, which shall be no later than September 10, 2018 at 11:59 p.m. ET but could end sooner. All others to respond: An exclusive offer.